Many a winter run has been postponed because of plunging temperatures. 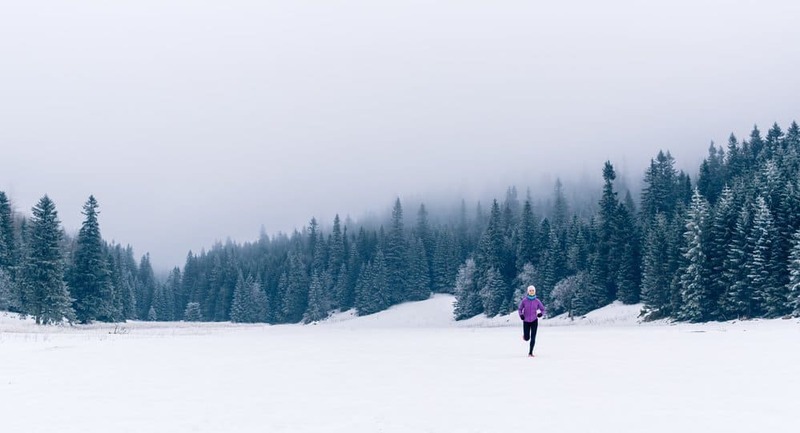 While it’s perfectly okay to take a day or two off when the cold is really biting, you don’t want to slack off too much on your winter training – you still have to be ready for your spring races. 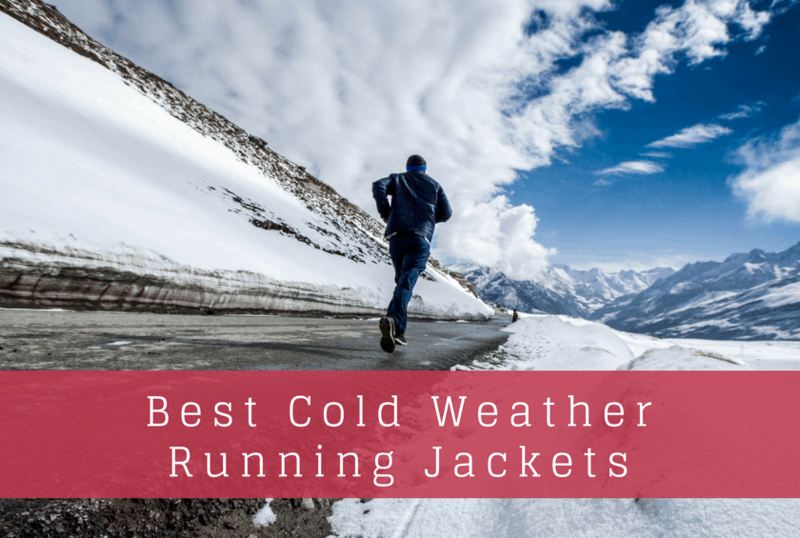 Therefore, a good cold-weather running jacket is a must-have for runners. Cold weather running jackets are different from other running jackets. They are made with thicker fabric, often with extra insulation around your core. For something less heavy and more versatile, check out our article on the best lightweight running jackets. We’ve reviewed over 20+ cold weather running jackets available now. These are the best of the best. 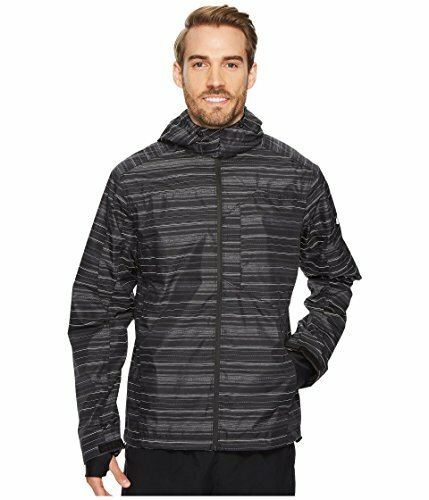 This breathable jacket by Brooks offers a soft, comfortable design with wind protection to keep you warm on those long, cold runs. The Turbine jacket is thick enough to keep you warm. But isn’t so thick that it restricts movement or feels bulky. It’s a nice balance between freedom of movement and keeping you warm. And even though this jacket does a nice job at keeping wind and rain at bay, it still remains breathable. Sweat gets wicked away as you run to keep you dry. There is a reflective stripe down the back for added visibility in low light conditions. There are also reflective elements on the front. You’ll still want to supplement the jacket with a reflective vest – but extra reflective detail is always welcome. Zippered pockets provide a place to store items during your run. One pocket has an internal pouch for storing a small phone, although one complaint is that the space isn’t big enough for large phones. Like many of Brooks’ jackets, the zipper has a notch to hold headphone cords. And we also like that this jacket is reasonably priced. 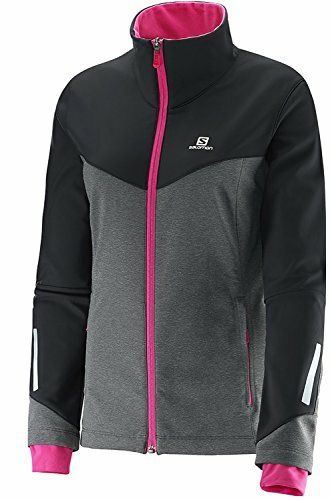 This lightweight running jacket has all the features to help you have a great run in the cold. This jacket fits snugly, with long collars and sleeves for maximum protection against the elements. It stretches to allow for a free range of movement. You can expect a tight fit especially around the waist (although it can be a bit loose for women with petite frames). Insulated panels cover your core. This jacket keeps you warm but won’t overheat you, thanks to its breathable Super Seal fabric material. The Cascadia Thermal jacket also packs down, so you can take it off mid-run and zip it up into a convenient package. The jacket’s reflective material keeps you visible in low light conditions. The ASICS Stormshelter jacket will keep you dry in even the nastiest of heavy downpours. The outer shell has a water-repellent finish and every seam is sealed to protect against the cold and rain. For enhanced safety at night, the jacket has reflective prints on the front and back for full visibility. On the face of it, the ASICS Stormshelter looks thick and fluffy, but it’s lightweight and breathable. The removable hood provides extra protection and flexibility in unpredictable weather conditions. The front zipper is water resistant, and cuffs are long, adjustable and fitted with gaiters and thumbholes. The side zipper pockets provide rain-protected storage for your belongings. The Stormshelter Jacket also has a zippered chest pockets with media port, and a loop in the collar for headphone cords. The Double Propulsion 60 Jacket by Smartwool has a merino lining; this keeps you warm while allowing you to move freely. Insulated panels on the front and back add extra warmth and a layer of wind and water resistance to the jacket. The best part of merino wool is that it resists odor. You can wear it year after year and it won’t develop any stinky “runner” smells. Merino wool is also super-soft, but keeps you warm even when wet. For the coldest days, you can even use the Double Propulsion Jacket as a mid-layer underneath another shell. So you can get merino wool warmth with core protection, and a shell on top to keep out wind and snow. 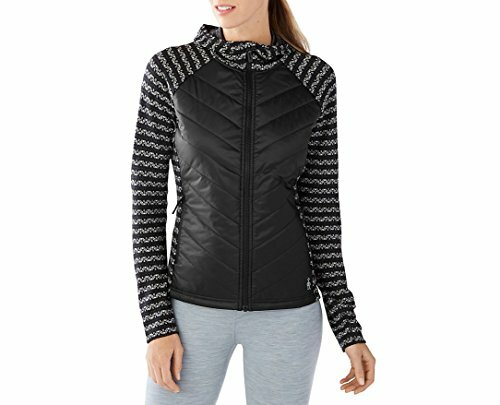 This jacket combines the warmth of a winter running jacket with reflective details that make it perfect for early morning or evening runs. The Lite-Show jacket is made with a soft outer layer that’s thick enough to keep out the cold. But it still allows for good movement. It will wick moisture quickly while you sweat. Thumbholes in the sleeves add extra warmth. This jacket has reflective elements on both the front and back, as well as on both sleeves. You’ll be seen easily when running in the dark. The Lite-Show jacket as two front pockets to store items, and a smaller internal pocket to store a phone or other more valuable items. If you are looking for a versatile jacket for both running and casual wear, the Salomon Pulse should be your first choice. It is super-lightweight to keep you comfortable as you burn calories running or walking. The advanced design inspires comfort and agility. You will relish the free and easy movement in this jacket. It comes with many features for water resistance and moisture wicking. As you make your daily rounds in the neighborhood, this jacket will protect you from both the wind and cold. 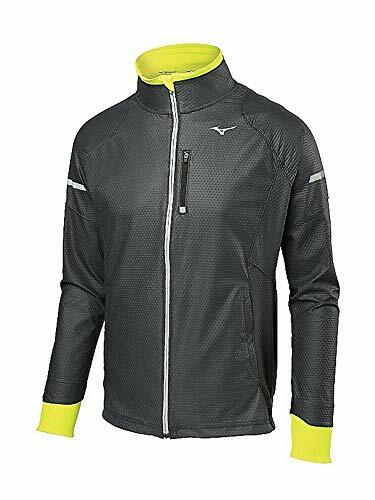 The Mizuno Static Breath jacket features a reflective design with thumbholes, water resistance, and moisture wicking. It is a comfortable piece of apparel that makes use of a wind-resistant shell. You’ll stay warm on the run without feeling weighed down. The jacket’s outer shell is lightweight and fused with Breath Thermo for extra warmth. This jacket also has two side pockets and reflective prints on the front and back. Its laser-cut holes allow for maximum air flow to keep you going during your run. 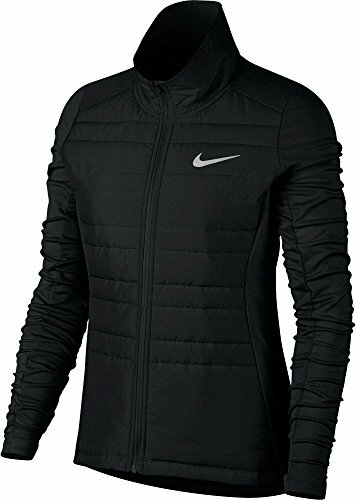 The Nike Essential Running Jacket is a good outer layer for cold, windy, and even rainy weather. None of these conditions should hold you back from going for a run, and with this jacket, they won’t. The Nike Essential ensures that through a water-resistant hood, water-resistant vents, and elastic cuffs that keep out the cold. The seams are sealed to keep away water and wind. The sleeves also have stretch insets to streamline motion. The fitted hood offers further protection against the elements. The hood has a cinch tie to secure it to your head in windy conditions. If you are a trail runner, this jacket is ideal because of its durable fabric that won’t tear when you brush against branches. You can wear other layers under this jacket and still feel comfortable. Its inner mesh provides additional insulation to keep you warm day or night. We all know that it is important to stay warm while running in cold weather. At the same time, we don’t want to be too hot and sweaty. 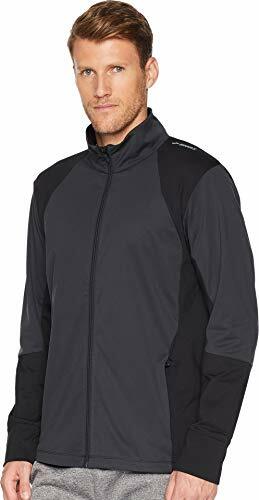 Thus, it’s important to find a cold weather running jacket that provides the comfort that you need against the cold, but also gives you the flexibility to run easily. A hardshell jacket is waterproof and windproof, and normally has a hood. It can also be insulated. The idea is to provide protection against the rain and snow in a lightweight, waterproof, yet durable package. It’s known as a “hard shell” because the fabric does not stretch very much. Often, it has a distinct “crinkly” sound—a hard shell jacket makes much more noise than a soft shell jacket, and it is durable. By contrast, a soft shell jacket is a water-resistant jacket that provides some protection from light snow and rain. It is important to note the difference between waterproof and water resistant. Some jackets can occasionally feature waterproof breathable technology, but in general, water-resistant is the way to go if yiou also want breathability. Soft shells are great for running, as they are breathable and flexible, and they can be great as an insulating midlayer under a waterproof hard shell on especially cold days. Soft shells do offer water resistance, so if it’s a light rain or snow, you’ll be just fine. However, for a serious downpour, you’d likely want a hard shell. Obviously, as the word “thick” implies, a thick jacket is going to be warmer, but at the same time, it is going to be more cumbersome, giving you less freedom to move. If the weather doesn’t get extremely cold where you live, a thinner jacket is likely going to be the better option, as it will be more breathable and flexible. However, there may be instances where the weather requires a thicker jacket. Knowing the winter climate you usually run in will assist you in selecting the best jacket for you. You might want to consider what the temperature is normally like in the colder months, and how often it tends to rain or snow in your area. North Carolina in the winter likely will not require a thick winter jacket, whereas Wisconsin definitely will! Finally, don’t forget about pockets. It’s important to know how many pockets you need for your gear. Most jackets come with pockets, but some do not. If you need to store items in jacket pockets, you need to know how many pockets there are as well as if they are zippered. You don’t want your phone falling out during your run or getting wet just because the pocket wasn’t zippered.